Karuna and Aurelie were friends. Then Aurelie went off and found the infernal armor of Ellicide and became the Evil Overlord Darkloft. Karuna is the only one who can stop her. 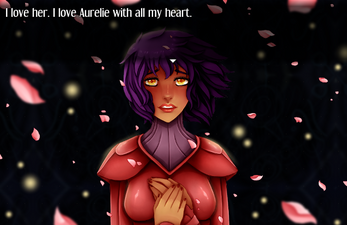 But Karuna loves Aurelie, even now. Luxaren Allure is a medium-sized RPG (12-20 hours) that follows Karuna and her allies as they explore the isles of Luxaren and confront a former friend who now wants nothing but destruction. This is a yuri (lesbian romance) game with an all female playable cast. Side View CTB Battles, with animated heroes and (semi)animated enemies! 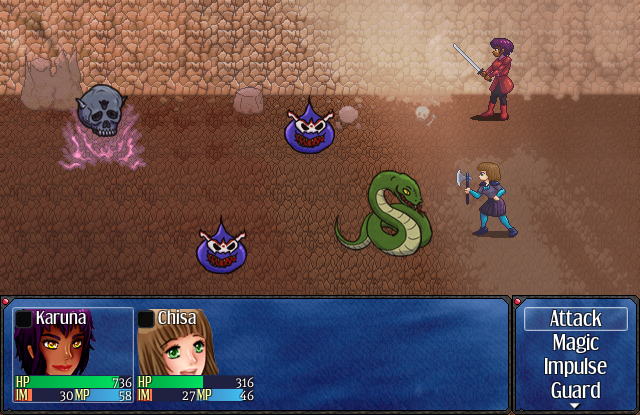 New tilesets and battlers, made just for this game! No random encounters. 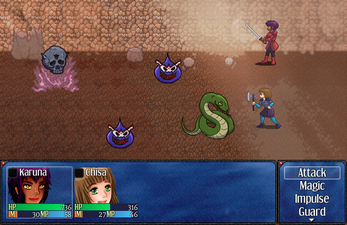 All enemies are visible on screen, and each triggers a different enemy party. No RTP needed! Most resources are custom, and everything's included with the download. A short, character driven story that plays with the standard RPG formula. Chisa is Karuna's self-proclaimed squire. She's timid but very strong, if a little naive. Her loyalty to Karuna is unquestionable. A mage from the Naga clan, and one of the few of her kind that does not view humans with suspicion. Carefree and laid-back, she quickly finds herself fascinated with Karuna's quest and even more fascinated with Karuna's squire. The great-granddaughter of the paladin hero Estes, Lynette is a well-balanced warrior from Rezael who has trained for years to master both the physical and magical arts to make up for the fact that she didn't inherit her family's holy magic powers. Now known as Overlord Darkloft, the evil one who has placed the isles of Luxaren in dire peril. Karuna has so many questions for her. What will happen with they finally meet again? Warning: Game may on occasion crash when trying to load battles. This seems to vary from computer to computer, and I've not yet been able to pinpoint the cause. For the time being, please save often to avoid losing progress. I apologize to any who have experienced this problem. It seems to have been present since the first build. If anyone figures out the problem, please let me know. Thanks very much and I hope you enjoy the game ^_^ If you get stuck on anything, please consult this page for tips and tricks! I just found this game a week ago. I am near the end. I just got 7/8 of those crystal things to make that weapon. I finished the treacherous journey to beat the bat thing holding the fairy queen hostage. I am close to the end. WAII!!!!! I like it so much. One tiny issue I have is the audio. I have to turn my computer audio almost down near mute to even hear it. My computer made it play SOOO loud. Other than that tiny issue, It's cool. I wish I could make things like this. I have great ideas for things, but I can't create them. HI! I just realized that today. I just beat that trio headed dragon thing and I'm getting mad now. Sadly I'm about early level 40's. Also, those blue boxes; I didn't know how to open them and get the key until I was too far into the dungeon. There are many reasons why I don't play games anymore. one of them are when you think the end is near and then they slap you in the face and say, "NOPE, You have to keep going." Just like my p.e. teacher. She counts down to stop and then say "and keep going!" I hope I can finish it soon. It still is an amazing game though. I wish I had the strength and endurance to even have patience to make something like this. I tried rpg maker and I got tired after two minutes of getting bored. Sorry for the endgame drag, but you're very close to the end. I got carried away while making it XD I'll do better in future games. Just finished the game today. I took a few days off because I feel embarrassed whenever my dad is home and I'm on the tower computer. He's always on the couch looking at what I'm doing watching something playing vr chat or whatever. So I do things when I'm alone. It took me a bit to finish the enemy off. I was between level 45-50. If I knew more ab out the game, I think I could do better. Didn't expect the hero to leave their town and go off. Out of all the characters, I wasn't a fan of Lynette.She was only jealous that she didn't get to play the hero role. I did enjoy Chisa and Merel's relationship. They make me feel a bit happy when I see then talking together. They are the odd bunch and I like them. I don't usually play games, but this one I seeked out was pretty cool. (HEART!) Cheers! Was this done in RPG Maker VX Ace? 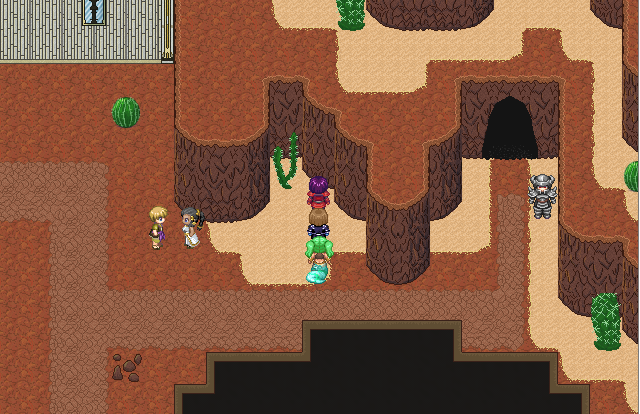 You think you'd be up for me giving a try at bringing this over to RPG Maker MV? Seems like it would be pretty difficult to port it over, given the fact that the scripts I use don't all have MV equivalents, so I think I'll pass. Thanks anyway, tho! I'd like to make my own MV game with similar themes sometime in the future. This game is so so so good I wish I could pay you for it. I'd easily peg it at 15 dollars, or even 20 if there were a bit more polish on some of the enemy sprites or a few more side-quests. Absolutely everything about this game is wonderful, it does a magnificent job of balancing the story's high-stakes drama with it's own brand of comedy. It might be somewhat derivative at times but it always makes it work and never feels forced for it's references and memes. Additionally it plays to standard tropes of Dragon Quest and Final Fantasy in a delightful manner, giving an explanation for why the king gives the hero a pittance of starting funds, and showing another ruler as being reasonable and just. Each character plays off one another excellently, with everyone exhibiting growth and development throughout the story as Karuna learns to open herself up to others, Chisa learns to be more confident, Merel becomes more earnestly happy with herself rather than acting confident out of spite for her haters, Lynette becomes able to admit her own weaknesses and failings, and Aurelie is able to reconcile the weakness that lead her to becoming Darkloft with the strength that allowed Karuna to rescue her. Thank you so much! ^_^ So glad you enjoyed the game! I really want to make another game like this. Maybe I will try charging for future games, maybe start with something like $10 and see how that goes. The plot is amazing. maybe a bit lineal, but it also has few side quests. There is a lot of plotwists, usuful items, a lot of different enemies, nice people and interesting places to visit during game. All five mine characters are amazing. I love them all. What a nice bunch of cute and good fighting girls :) . 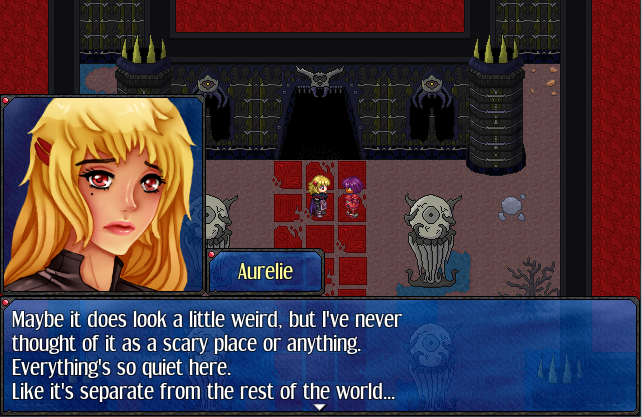 If I'd had to make this extremely hard and choose only one, I think I'd choose Aurelie. She is villain though most of the plot but when she became good again... I just can stop thinking about how adorable and cute she is ♥ . Merel can be my 2nd favourite and she + Chisa = the cust couple. Artstyle is amazing. Sprites in battle, sprites in travelling, portatrait, CGs and locations. Evrything looks great ♥ It the best and the best looking game made in RPG Maker I've ever played. Even if I usually don't like game made on this engine nor the ones without choices in plot. I wish this had an option for Mac, I'd really love to play it. Help, I sent a review for your game but I don't know where I can read the others. I wrote it in portuguese, but I'll edit it to make it multi-language (english will be added). Where do I click to see all reviews for this game? I don't have any reviews on itch.io yet (that I know of) but you can read a lot of reviews of the game on RMN (https://rpgmaker.net/games/5854/reviews/) I am not sure how to view/submit reviews to this site but I'll try to find out! I wanted to say that your game has gotten me into a "search for games with inclusive narratives and gender/sexual orientation/ethnic diversity/etc" streak. Please, do it, pretty pleeaaaaase! This game is awesome. I haven't beat it yet but it is really addictive. You really hit the right notes with the plot and the game play reminds me of the older Final Fantasy, and Dragon Quest games. I just beat it last night, and started to play it all over again, :), Great ending and I am pretty sure from the ending video that Merel and Chisa were married by the fae queen which is super cute.